The SEC has been wild this conference basketball season, with plenty of upsets, road struggles and incredible individual performances. The Tennessee Volunteers and LSU Tigers are the last remaining undefeated teams in conference play, with Kentucky, Ole Miss and South Carolina all sporting only one loss. It’s been an exciting year, and there’s still plenty of action left before the SEC Tournament. The Aggies won a thrilling game in Tuscaloosa last week, with star G TJ Starks sinking a running shot to beat the Crimson Tide. However, in their two games since that thriller, they’ve lost at home to Auburn and Mizzou by a combined 42 points. In Saturday’s 66-43 debacle against Missouri, Starks wasn’t even in the starting lineup, finishing with only 2 points in 18 minutes of action. The uninspiring effort this week caused coach Billy Kennedy to rip his team, but with a trip to Florida and a home game against a tough Kansas State squad looming, things could get worse before they get better. Hammonds had zero points against Florida on Saturday, a game the Bulldogs lost by 10 points. If he had kept his 13.7-point average, it could have been a much better ballgame. This was the second time Hammonds has been held scoreless in SEC play (the other was the opener against Tennessee). The sophomore forward has loads of talent and still finds ways to impact the game when he’s not scoring, but since Yante Maten isn’t walking into the Georgia locker room anytime soon, Hammonds needs to be a more consistent offensive weapon. He’s scored 19 points against Vanderbilt and 11 points against Kentucky, though, so he’s capable of scoring in double figures against SEC competition. The Tigers would be “on fire” if it wasn’t for Tennessee (see below). In a battle of teams that were unbeaten in SEC play on Saturday, the Tigers defended their home court, blowing out South Carolina 89-67. They’ve won 7 consecutive games and end January with a 3 favorable games — vs. Georgia, at Mizzou and at Texas A&M. This is an LSU squad that should crack the Top 25 in next week’s AP Poll, and that slate of games should see Will Wade’s team extend its winning streak to 10 before the calendar flips to February. Petty exploded in the second half against Tennessee on Saturday afternoon, scoring 30 total points and hitting 6 of his 10 3-point attempts. He’s topped 20 in 2 of his past 3 games (22 vs. Texas A&M) and can absolutely carry the offense when he’s on. He needs to develop more consistency, but a performance like that against a team that could be No. 1 on Monday should give him plenty of confidence moving forward. I’ve been high on the Vols all year and they just continue to dominate. This is one of the most exciting teams to watch in the entire country, and the way they managed to squeeze out a win over Alabama on Saturday shows they can deal with adversity. Grant Williams is everything you want in an All-SEC player, and the Vols have plenty of talent around him. 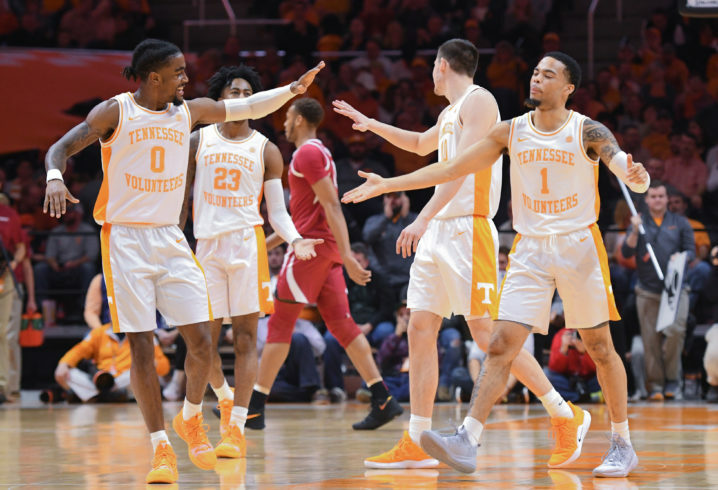 Rick Barnes isn’t letting this team get complacent, and after nearly blowing a 15-point lead against the Crimson Tide, expect the Vols to take out their frustration on Vanderbilt on Wednesday night. Hagans has extended his own Kentucky record by having at least 3 steals in 7 consecutive games (including a whopping 8 swipes in a win over North Carolina). He needed a stat correction after Saturday’s win at Auburn, but ended up getting the necessary 3 on his resume to keep the streak alive. He only had 6 points against the Tigers, but he is becoming everything the Wildcats need him to be, grabbing 7 rebounds and dishing out 6 assists. 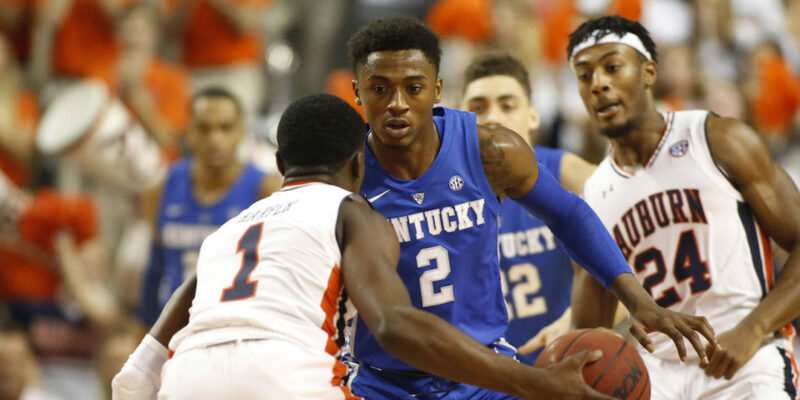 Much like Shai Gilgeous-Alexander came into his own during SEC play last year, Hagans is looking a lot like his predecessor. The four other starters around Hagans on Saturday had at least 13 points each, and that was in large part to Hagans’ role as a facilitator. Following a 23-point effort against Georgia, it’s safe to say coach John Calipari is happy with his freshman point guard these days. LSU blew two games early, but is playing much better now. Still not great, but with some teams in the conference not living up to expectations, it’s nice that at least LSU isn’t one of those. Tennessee is playing great and Kentucky still isn’t playing their best basketball. Ole Miss is far exceeding their expectations, but they are really the only team doing so. That sounds a little like State. We tightened up down the stretch of two 50/50 games which we lost to SC and Ole Miss. I feel like it might have woke us up because our defense finally started trying and we pulled out a win against Florida and blew out Vandy with the D. I still like our chances in any game, but there aren’t very many pushovers this year. Vols may very well be #1 today but if they don’t start finishing games like they were doing it won’t last long. Petty was unconscious Saturday. Vols have played back to back uninspired second halves and #1 teams don’t stay there long playing like that. LSU playing really well right now.Ole Miss and the fighting Kermits may be the team you want to play least in the sec right now. Ky rounding into form. Should be an interesting February. I watched the game and have to say Alabama is a bad matchup for Tennessee. They are a long, athletic, and aggressive team. I always liked Petty and felt like he was unfairly overshadowed by Colin Sexton last year (who I personally thought was overrated as a basketball player.) Alabama lost some games they could have won this year and are much better than their record. Spot on. 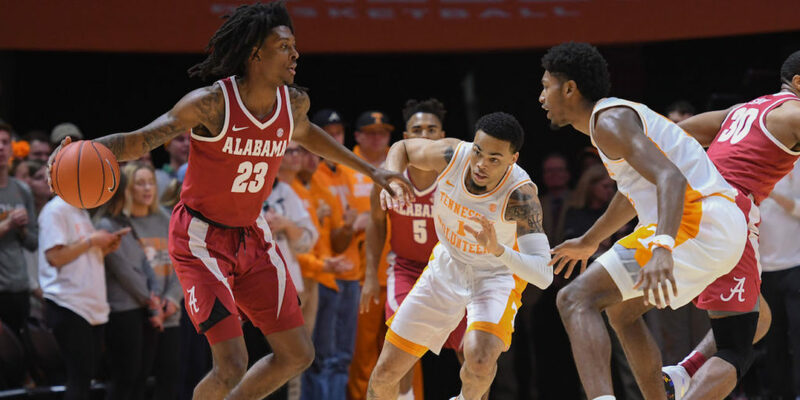 VOLS struggled with Bama’s length and their defense against the 3 has been rough thus far. They will need to adjust if they want to keep the #1 rank for more than a couple weeks. Not sure why Kennedy is still here. He should have been fired last year. Made the program worse, got to the sweet 16 on talent alone, not coaching. The time is past due for a change.